The shimmer of the South Seas floats through Bali, with its totemic designs evoking island idylls - an escape from a too-contemporary world. No details were spared in weaving this intricate piece. 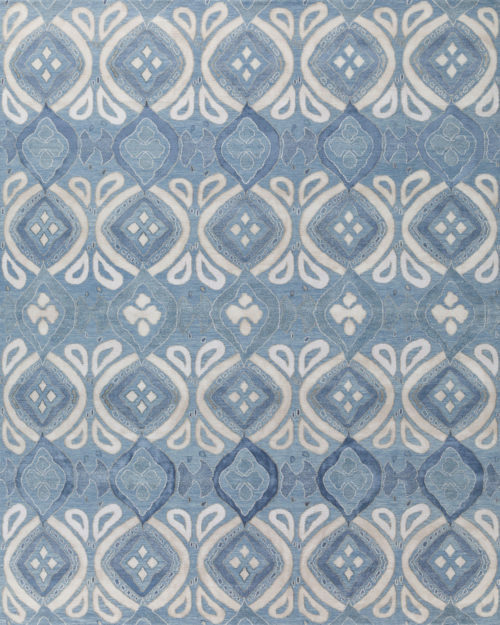 The cornflower blue Tibetan wool background features a looped bouclé knot creating a distinct texture and also utilizes a special dyeing technique that layers darker and lighter tones to create a heathered effect. The motifs throughout are composed of varying fibers, from true 100% pure silk to our unique blend of wool, silk and nettle fibers which adds depth and shine from every perspective. The design elements feature tones of ivory, grey-blue, platinum and cadet blue. This piece has been crafted by hand in our true 100 knot quality.